From a material perspective, life in America gets better and better. From a moral perspective, we cannot make the same claim. One manifestation of our moral decline is how the country, thanks to the Democratic party and the Left, is getting meaner. The case of Virginia governor Ralph Northam and a 35-year-old racist photo from his medical-school yearbook is the latest example. A generation ago, Americans not only forgave the sins of public figures; they sometimes forgave too easily. But throughout American history, Americans understood that sinners can turn their lives around. They understood that what someone did 30 or 40 years ago did not forever disqualify the individual from being deemed a decent person if he or she had led a decent life after that. Americans understood that people can morally change and that we should embrace such change. It was called repentance. And in a religious America, penitence and forgiveness were considered vital to the moral health of society. The most famous Christian prayer, the Lord's Prayer, recited by both Catholics and Protestants, is about forgiving others: "Our Father, who art in Heaven . . . Forgive us our trespasses, as we forgive those who trespass against us." Judaism's holiest day is the Day of Atonement (Yom Kippur), and its most sacred work after the Bible, the Talmud, teaches, "In the place where penitents stand, even the righteous do not stand." In other words, those who have done wrong and then repented are on a higher moral plane than those who've never had to repent. Having abandoned the Bible and religion, the sources of wisdom in America and the West, our society has become both dumber and meaner. The notion that a man who had exhibited no racism in 30 years should be driven from office because of a racist photo in his medical-school yearbook page would have struck our grandparents as un-Christian, un-Jewish, stupid, and mean. Not today. Thanks to the corrosive influence of the Left and the party that has forsaken liberalism for leftism, America is a less compassionate nation. Its heart has been hardened. And its mind has been weakened. I said this with regard to Roy Moore, the former judge who was accused of having acted inappropriately with teenage girls 40 years ago, and who has led an honorable family life all the decades since. I said it when Judge Brett Kavanaugh was accused of having sexually assaulted a girl at a party 36 years ago, when he was in high school - after having led an honorable family life, as universally acknowledged, since then. And I say it here. Governor Ralph Northam had a racist photo on his medical-school yearbook page but has led a life free of racism for the 30 years since. All three of these men should have been forgiven. (I need to note here that I believe Judge Kavanaugh was falsely accused of sexual misconduct). None of them should have had their names and reputations dragged through the media mud; none should have been driven from office or driven from seeking office. But thanks solely to the Left, we are an increasingly mean and foolish nation. Having said that, Northam brought this treatment on himself. His race-baiting ads attacking Ed Gillespie, his Republican opponent for Virginia governor, were vile and, by all counts, played a significant role in his winning. 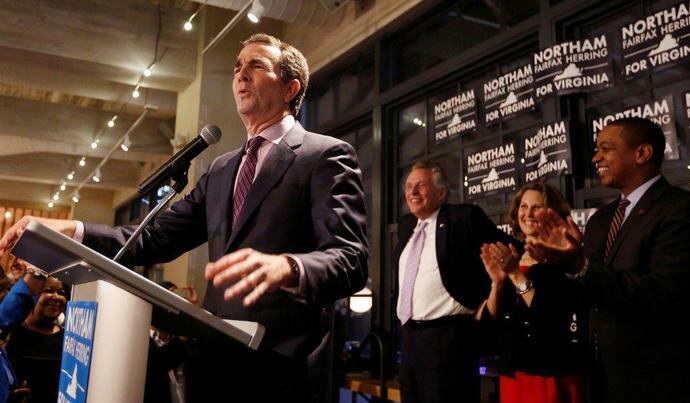 Northam's campaign defended what is one of the most morally obscene ads in American political history. The 60-second video shows a pickup truck flying a large Confederate flag as the truck drove toward children of color - a Latino, a black, a Muslim, and an Asian - who are urging one another, "Run! RUN!" as they flee for their lives. During the pursuit, the camera pulls back, showing the truck from the rear and a bumper sticker that reads "Ed Gillespie for Governor." In other words, because of Northam's cynical and immoral use of the racism card, he deserves these calls for his resignation. As I watch the monster he and his Democratic party have created devour one of its own, I can only conclude that maybe there really is karma. The tragedy is that while he deserves it, America doesn't. The only hope for America is that liberals and conservatives will awaken to the mortal threat leftism poses to everything good about us. Let's pray that what happened to Moore, Kavanaugh, and now Northam sounds the alarm that will awaken them. Former U.S. Vice President Joe Biden will announce on Thursday that he is seeking the Democratic Party's presidential nomination for the 2020 election, a source familiar with the plans said on Tuesday. Biden, 77, a longtime senator who served for eight years under Democratic President Barack Obama, would join a crowded field of nearly 20 other candidates seeking to defeat Republican President Donald Trump. Biden is expected to make his announcement by video and would bring an end to months of speculation about whether he would challenge Trump, who followed Obama in the White House following his 2016 victory over Democrat Hillary Clinton. An Israeli cabinet minister condemned U.S. Democratic Party presidential hopeful Bernie Sanders on Tuesday for describing Prime Minister Benjamin Netanyahu's government as racist over its treatment of Palestinians. While enjoying unprecedentedly strong backing from the Republican administration of President Donald Trump, some Israelis have been fretting about whether this comes at the cost of losing traditionally bipartisan support in Washington. Addressing a televised CNN event alongside other Democratic candidates on Monday, Vermont senator Sanders said he was "100 percent pro-Israel" but proposed changing U.S. policy toward it.